When designing a home along the coast, it's only natural to bring in some of those elements inherent in the home's surroundings and native to the area. But, be careful not to go overboard. A home full of beach- or coastal-themed items can be sensory overload. Instead, adding subtle touches to a room can convey a much more powerful statement. Take this Palmetto Bluff home. The subtle blue and green coastal colors used in this bathroom are a great way to bring the coastal scenery and color palette inside. The bluish-green wall color is reminiscent of the nearby waters and makes the room feel serene and inviting, just like the coast. This home sits among some of the most pristine surroundings you will ever see so we wanted that environment to stand out and be appreciated within the home. Bringing in soothing colors found outside allows the exterior surroundings to take center stage. The palm trees near the May river and the freshwater pond near the garden are not only reflected in the home through the color palette but are now the focal point. How do you feel about bringing the coastal colors and scenery indoors? 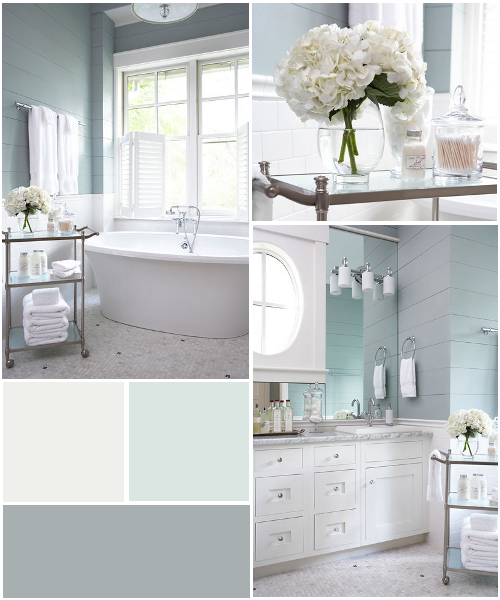 Like some of the accessories you see in this coastal bathroom? Below is a list of some of the accessories that are now availabe in our online boutique. View additional photos from this Palmetto Bluff home.